Sometimes there are decisions that need to be made however, and when it comes to whether you should or shouldn’t be stroking that ageing server along for another year for example, unfortunately the ‘if it ain’t broke, don’t fix it’ mantra doesn’t always apply. On-premise servers are absolutely relevant in 2019, but at a time when two in five business have been subject to cyber crime in the past 12 months, they absolutely must be patched, secure and properly maintained if they’re in any way important to your business. If you don’t have time to do that, an Amazon Lightsail server may be a good option as it’s both simple to spin up and will let you continue using exactly the same software your on-premise server is running currently (in most cases!). Using cloud service providers to replace on-premise servers isn’t a new thing. In recent years the big players, Microsoft, Google and Amazon have grown their services to the point that they are all incredibly powerful but they can also become quite complex, making them daunting for the less technical user. 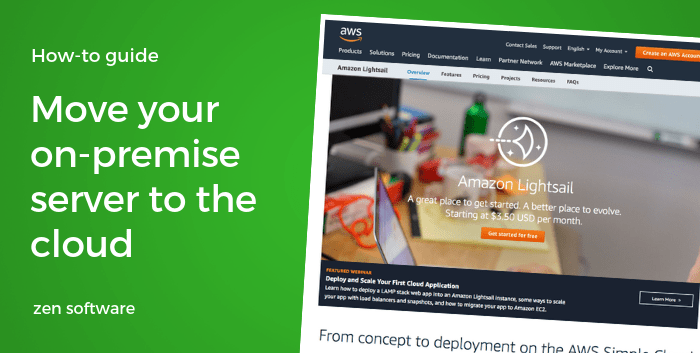 In this post, I introduce Amazon Lightsail product which makes it much easier to get your first cloud-hosted server up and running and replace that old creaky on-premise server. Why would you want to move your server into the cloud? Lightsail is an Amazon virtual server hosting product, focused on simplifying the steps needed to build and run a cloud-based virtual server. In this post I’ll show you how to use Windows 2016 server image. Once set up, the server runs just like any other standalone Windows server, but with its own Public IP address that you connect to over Remote Desktop Protocol to further install the software you wish to run. This makes it an ideal platform to archive email for Office 365 using MailStore Server, or to run your own MDaemon Mail Server which need to be available 24/7, but don’t necessarily have to be located within your own office network. Running your servers in the cloud like this is an ideal way to minimise the cost and complexity of your on-premise network components, and makes remote working or home working easy as all clients work in exactly the same way. What’s involved in spinning up my own Lightsail server? Before you can use any Amazon AWS services the very first step is to create an account with Amazon. This account is referred to as the root account and will have full access to set up and use all Amazon AWS services. It’s worth noting that all new AWS accounts come provided with many free tier services as a bonus but you will be required to enter credit card details in order to set up an account. To start the process of creating an account visit the following link and run through the setup wizard. Once you have created your AWS account you can now navigate over to the lightsail product page to begin setting up your first server instance. Once you’re within the setup wizard, it’s now a simple case of choosing the relevant option for the instance. To start with you should select a location to host the instance ‘London, Zone A‘ in our example. Next, we need to choose the platform, and we’ll choose ‘Windows‘. Scrolling down further we can now choose which Windows O/S we wish to use. In this example we will be using the latest ‘Server 2016‘ image. Scrolling down even further we’ll choose an ‘Instance Plan‘. By default, the plans are ordered by price per month but you can also organise them by memory, processing power, storage or data transfer if you prefer. For our example, we will be choosing a Plan that is suitable for hosting an MDaemon server for up to around 50 users. With that in mind, we’ve have picked the $20 USD per month option. The final stage is to name the server and click on the ‘Create Instance‘ button, to go live. This will start the instance and you will see it in ‘Pending’ status. You can click on the instance to administrate it. This shows you all of the settings for the Instance and importantly the public IP address and connection details. After a few minutes, you should be able to click on the password for the default ‘Administrator’ user and either connect using Remote Desktop Protocol or connect using the web-based RDP client provided. Before you continue to work on accessing the instance remotely we recommend that you fix the Instances IP address. By default all instances are assigned a Public IP address however this IP address will change when the instance is rebooted. Not ideal for any public accessible servers such as an MDaemon email server! 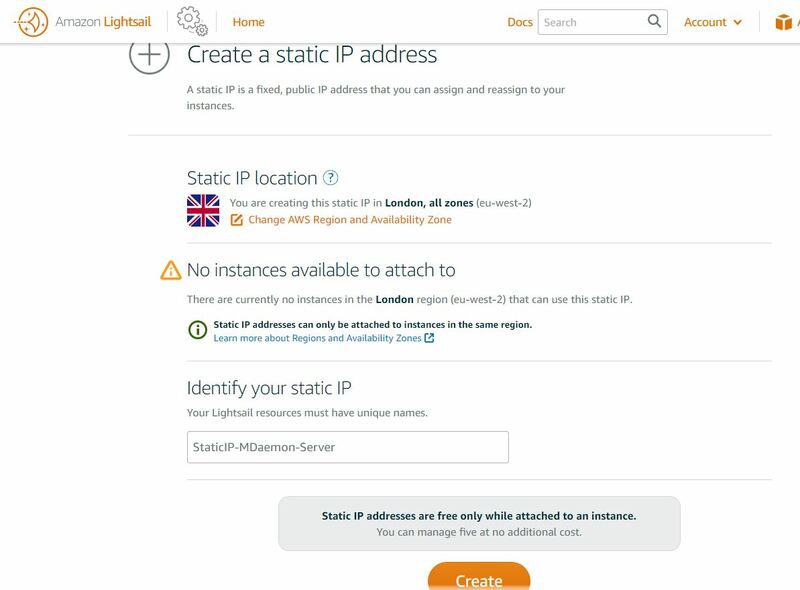 Within the main lightsail ‘Home’ menu select the ‘Networking’ section and create a Static IP. Then attach this newly created static IP to your recently created Instance. Now the instance is running on the correct Static IP address its a good time to look at the firewall section to define basic Firewall rules to control access this is under the instances own ‘Networking’ section. In the case of mail services like MDaemon or SecurityGateway, these will require that multiple TCP ports are made available to the outside world. Here you can open up specific ports to be accessible publicly. Unfortunately, there is no option to define the source IP address or ranges that can access the port. If you do require access to be limited to specific IP ranges then this will need to be configured within the windows firewall on the instance itself. The metrics section gives a real-time and historical view over key instance statistics such as memory and CPU load which helps you spot if an instance type is suitable for the load it is currently dealing with. The snapshot tab can be used to take manual snapshots of the instance to allow for restorations to either revert an instance to a known point in time or indeed duplicate an instance. In order to snapshot the instance, it is recommended that it should be prepared and stopped first. This can be useful for disaster recovery scenarios, but for file-based backup, we recommend you install a 3rd party backup tool within the instance such as BackupAssist and take regular backups of the unique server data. For example for a server running MDaemon it would be ideal to use the BackupAssist Standalone cloud Backup licence to run daily backups of the MDaemon directory structure to a specific Amazon S3 bucket, This would allow for a secure, super fast and low cost backup that could easily keep 30 days or more retention. Now that you have a root account setup it’s good practice to add protection to that account by turning on MultiFactor Authentication. This option will require you to add a one time token every time you log into the website. Your server is now ready for your data and applications. If you’re using one of the products we distribute and you have up to date upgrade protection, you’re welcome to give us a call and we’ll gladly give you a steer in the right direction regarding migration. We can’t support any applications not purchased from us. Neil, would I run the Multi tenant version of Mailstore and MDaemon on this platform? Hi Paul, Yes you could do, at the end of the day is a Windows Server running in the Amazon Cloud. Lightsail does not have quiet the flexibility as full blown AWS when your looking after 10’s of servers , but for an entry point to build a one or two server setup it could work well. Make sure you consider a Backup Strategy. for the stored data so you have a copy elsewhere.